Another case of Police brutality hit the news last week, however unlike the many stories of brutality against black men in America, this was an act of violence against a black British female. 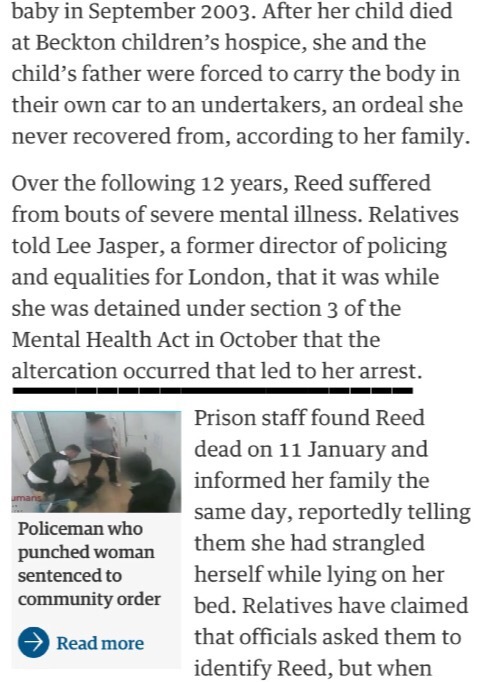 Sarah Reed suffered from Mental ill health after the death of her new born child in 2003. In 2012 she made her first run in with the the authorities when she was falsely accused of shoplifting at a store on London Regent Street. While in police custody, CCTV footage shows how readily and viscously a police officer attacked her. (I would urge you to watch the clip below as it very much speaks for itself). Fast forward to 2nd February 2016, Sarah Reed was found dead in her prison cell after reporting strangling herself. What’s particularly sad about this story is that the only reason we are aware of it is because Sarah’s family approached lee Jasper (ex director of policing and equalities) to ensure their story was told. But this request was made after several pleas to mainstream press, who were under the instruction by the ministry of justice not to report on. Secondly, despite the fact that once the story was published it went viral, there has been subdued media coverage since and even when it is being covered, certain aspects of the story are taken out. For example, the reason why Sarah was put in jail in the first place. The first photo tells Lee Jasper’s description of the events, whilst the second photo shows how the guardian’s initial article tactically washes over the issue, referring to her assault as an ‘altercation’. 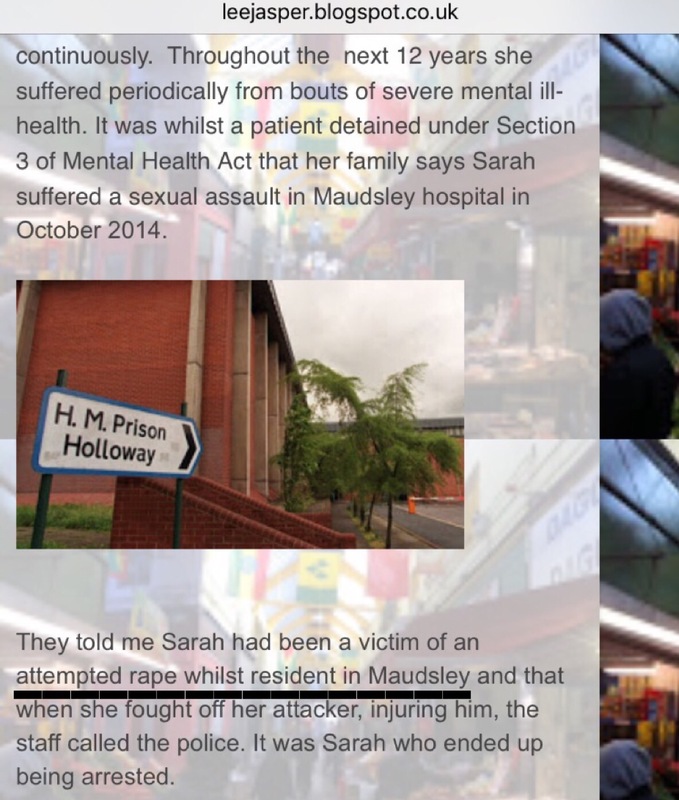 Sarah’s story highlights issues of violence, sexual assault, institutional racism and negligence. Often times, (well I know for myself anyway) Black British people look at situations in America and in comparing it to the UK, can become accepting and tolerant when it comes to any form of racial injustice. Whether or not you view this particular story as racial, this was a woman who suffered greatly at the hands of the institutions that claim to protect us. Therefore, her story must be told. Especially since this is a mysterious death that didn’t receive much media coverage, we have to question why?